The main horizontal seismic force HX is applied at each diaphragm of a building due to the seismic action along the axis X of the building. 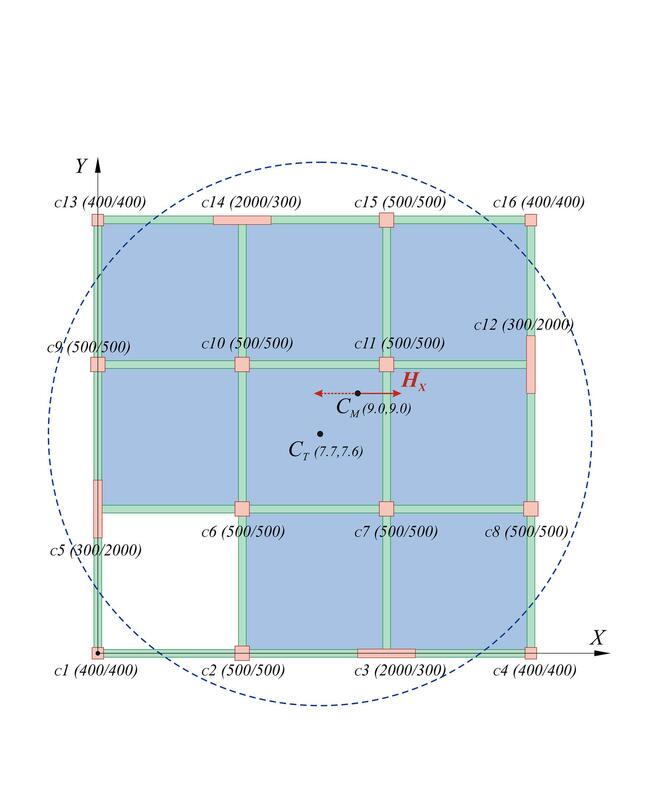 Thisforce is applied at the diaphragm's centre of mass CM and generates the moment MCTΧ of magnitude |HX · eoY| about the centre of stiffness CT. 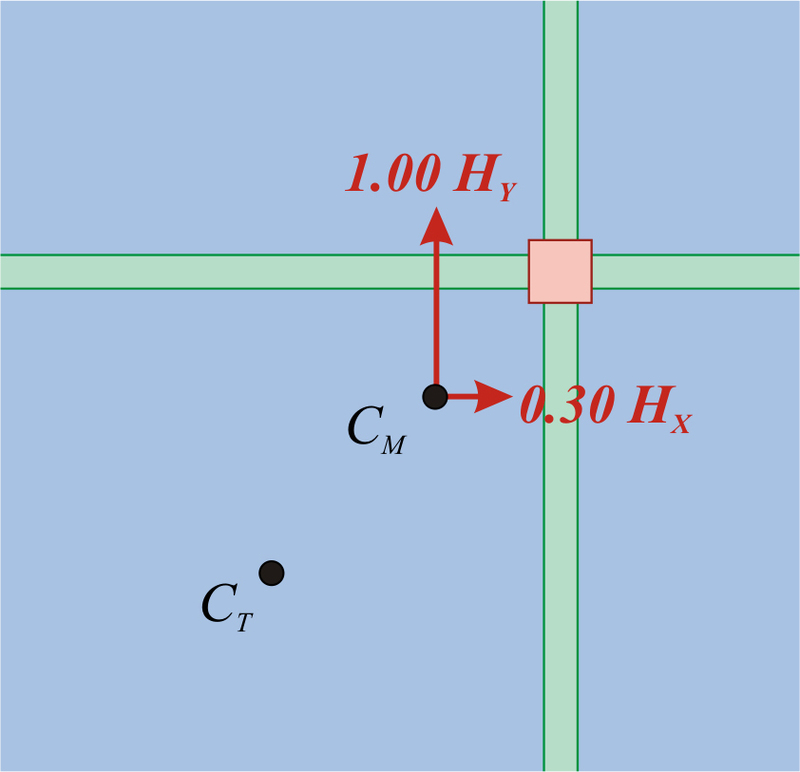 The same situation exists for the Y axis where the corresponding moment MCTY has a magnitude equal to |HY · eoX|. The sign of seismic forces changes continuously resulting in combinations having either positive or negative values of them. The magnitude of bending moments depends however on the size of the structural eccentricities eoX, eoY. The position of the centre of stiffness and thus of the structural eccentricities is examined in §5.4 and in the Appendices C and D.
Figure 6.5-1: Typical floor plan. CM is the centre of mass. CT is the centre of stiffness. Figure 6.5-2: Detail of the CM, CT region. eoX, eoY are the structural eccentricities. 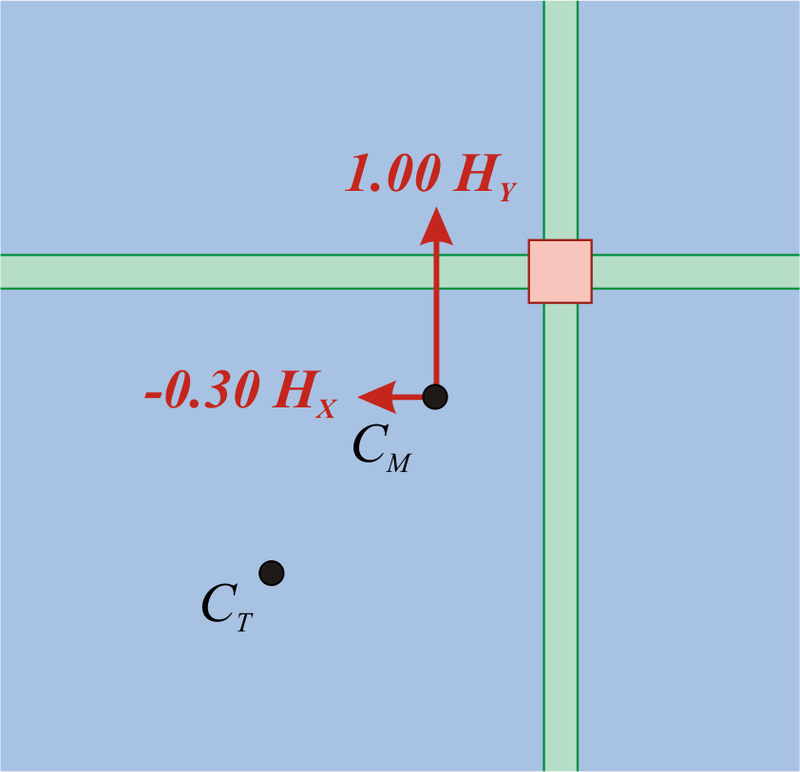 The axes Χ, Y are conventional because in reality, during an earthquake, there will always exist components of the seismic action along both X and Y directions either because the seismic waves arrive at an angle other than 0º or 90º or because the geometry of the structure is such that a seismic excitation along X generates one along Y and vice-versa. (1) The general case is "γg · g + γq · q", while the probably required unfavourable loadings and the probable special checks are set according to chapter 2. (2) The general case is 1.00g + ψ2 · q. The values of ψ2 are cited in §2.2.4. 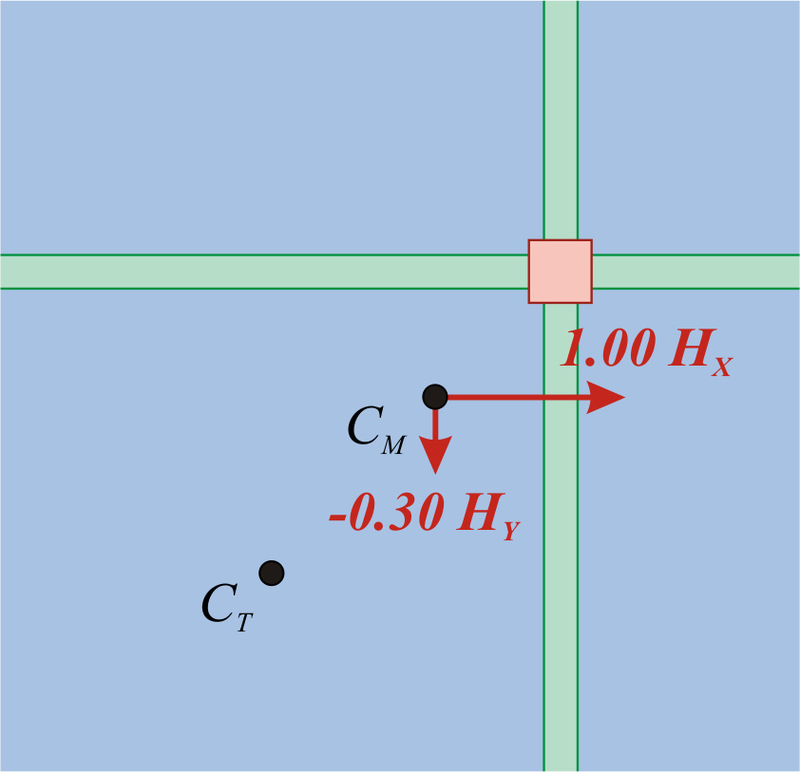 (3) For simplicity reasons and since the effect of the vertical component of the seismic action is either insignificant or of local importance only, the Z direction is omitted. 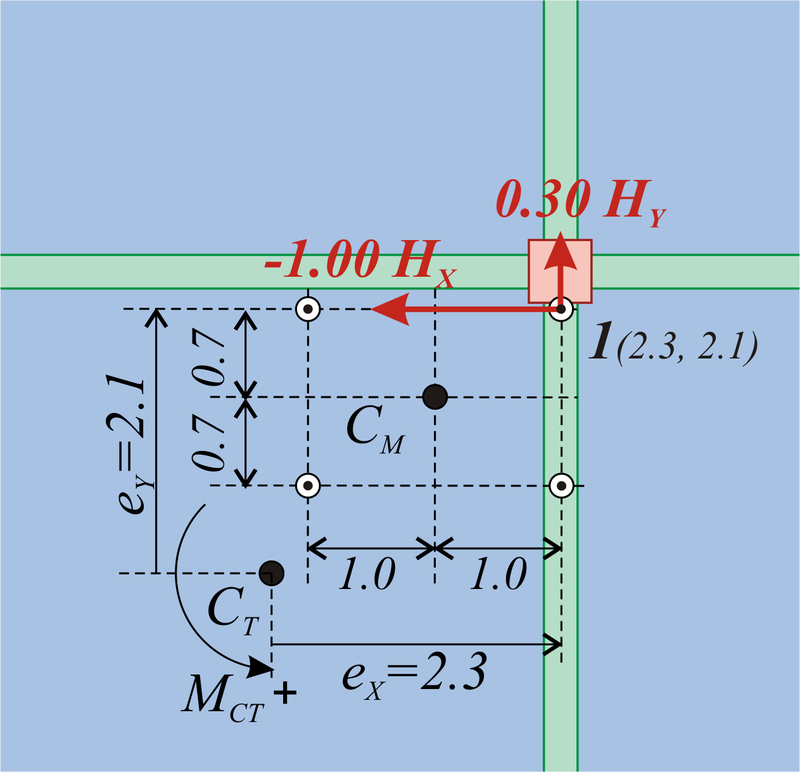 (4) The symbol "+1.00EX" implies «100% of action effects due to application of the seismic action along direction X», while the symbol "0.30EY" implies «30% of the action effects due to application of the seismic action along direction Y". The symbol "+" implies «to be combined with». 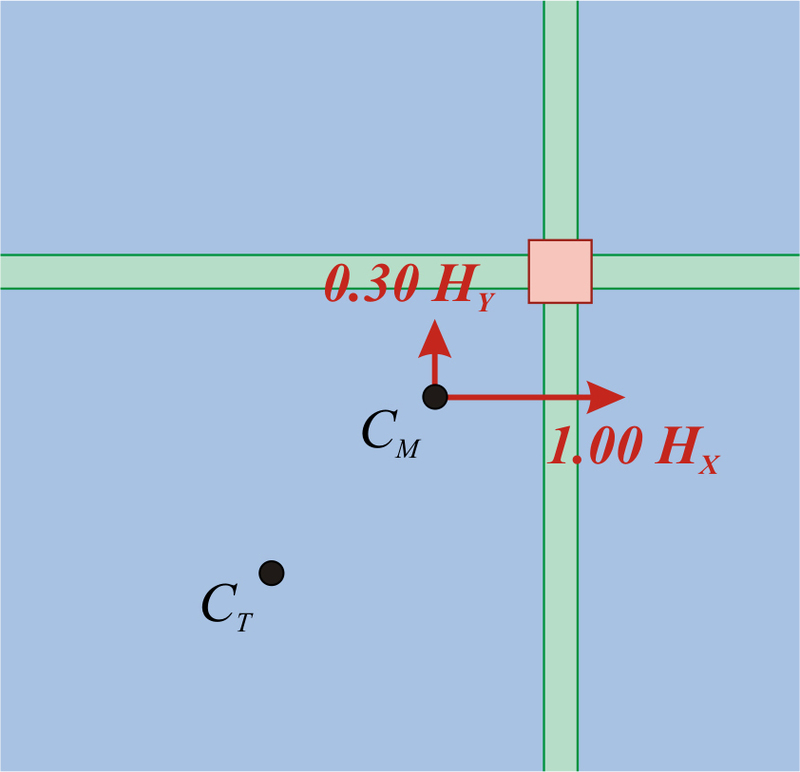 According to §5.4 seismic moment on a diaphragm causes rotation resulting in increased displacements of the perimeter columns and in the development of biaxial bending in columns. The centre of mass of a storey is defined by the architectural design and is minimally affected by the mass of the structural elements. 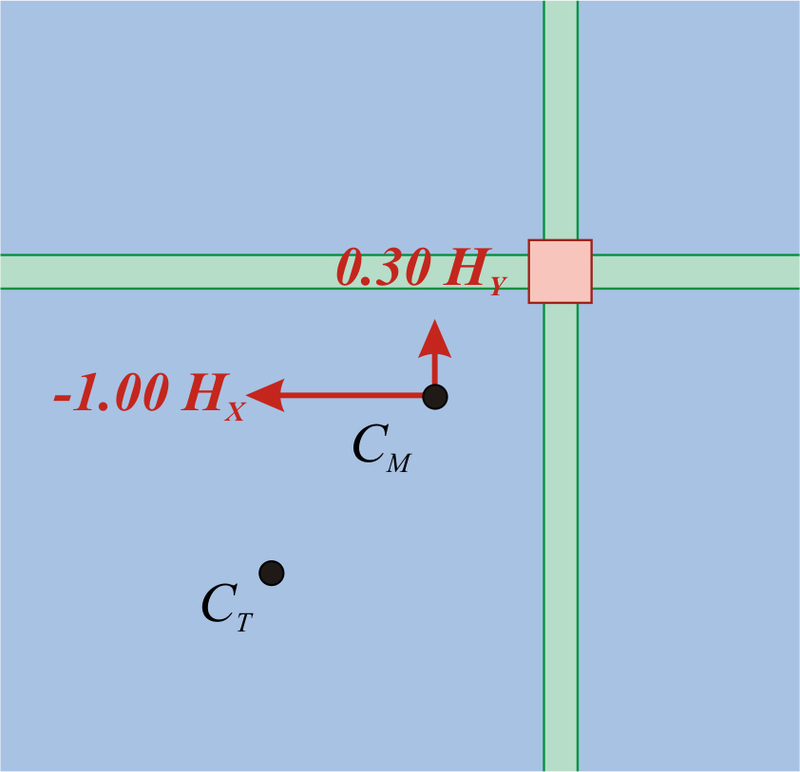 The fluctuation of the centre of stiffness can be significant because it depends on the cross-sections of the structural elements and mainly of the columns. The architectural limitations cause some difficulties which may be overcome by the cooperation of the structural engineer and the architect. Thus, the structural engineer's art consists in designing a structure in such way that the storey's centres of mass and stiffness are as close as possible, i.e. in minimizing the structural eccentricities eoX, eoY. 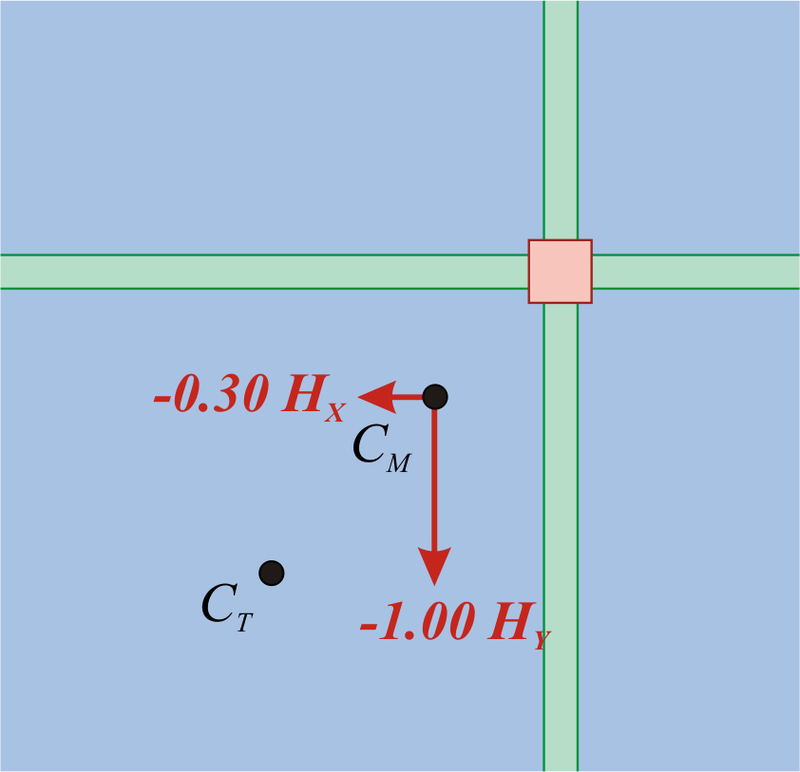 The attainment of such a goal has also a profound positive effect on non-earthquake resistant structures due the reduction of the undesirable structural rotations and the consequent structural displacements. The most efficient design achieves the coincidence of centres of mass and stiffness, an easy task in buildings symmetrical in plan with respect to the two orthogonal axes. Of course, the centre of mass of the diaphragm may be shifted during the earthquake, due to eccentric loading. Uncertainties also arise in the location of the centre of stiffness due to several reasons, such as the different potential mechanisms of elasto-plastic failure at various floor regions e.g. due to masonry walls or unintended construction flaws including heavily reinforced beams with respect to columns, etc. In order to limit the uncertainties, EC8 imposes the use of accidental eccentricities, eccΧ and eccY equal to 5% to 10% of the LX and LY diaphragm dimensions, respectively. These eccentricities should be considered for all possible combinations. For each of the four points there are eight combinations, i.e. totally required: the Α combination and the 4 · 8=32 combinations à total amount of 33 combinations. The bending moment and shear force envelopes derive from these 33 combinations. 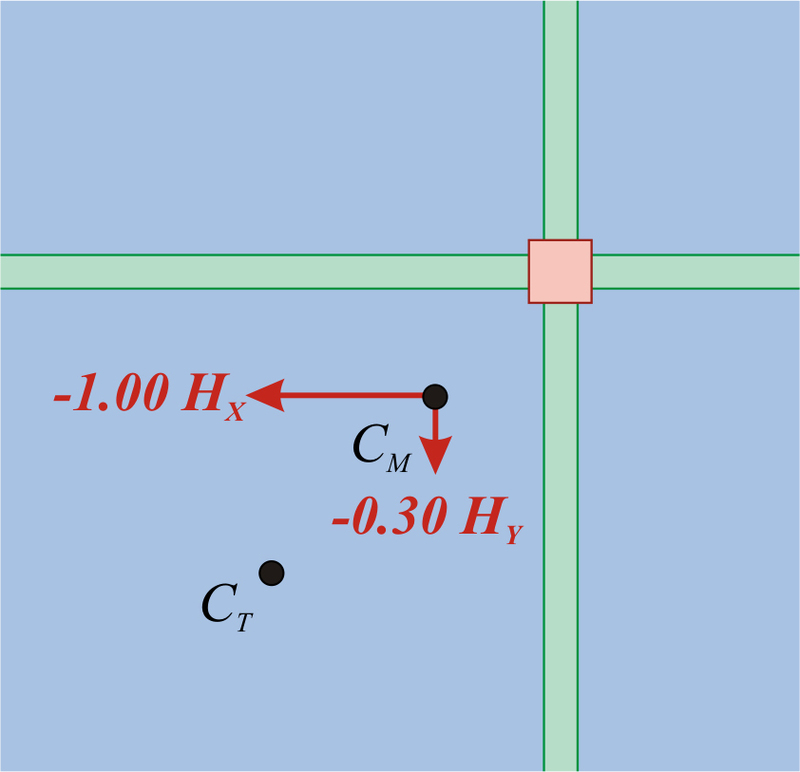 The most unfavourable stress resultants of columns and beams cannot be predicted since it derives from the superposition of gravity and seismic loadings each multiplied by different weighting coefficients. 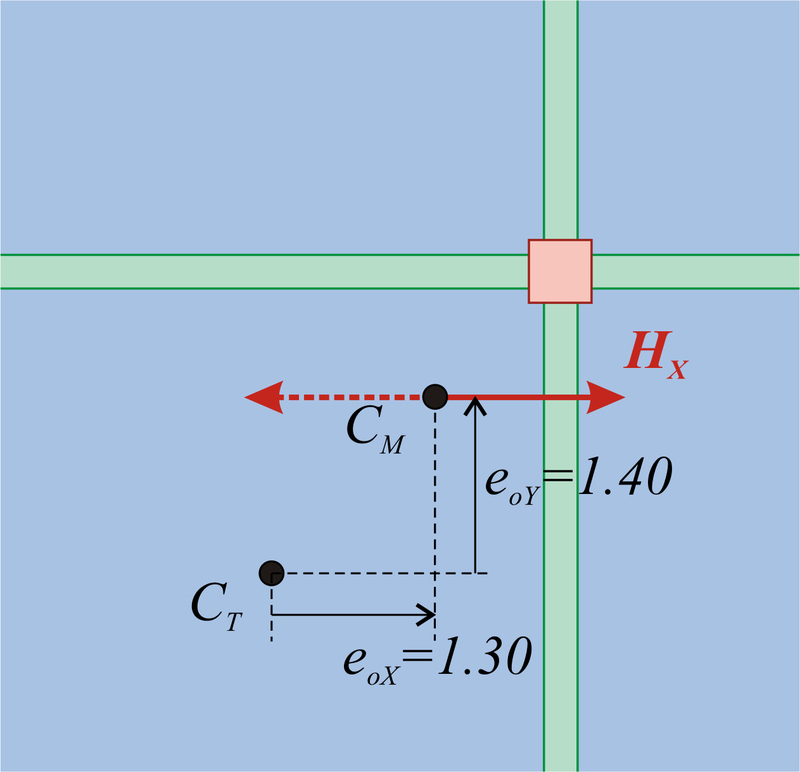 Moreover the most unfavourable biaxial bending of a non-square column cannot be predicted. 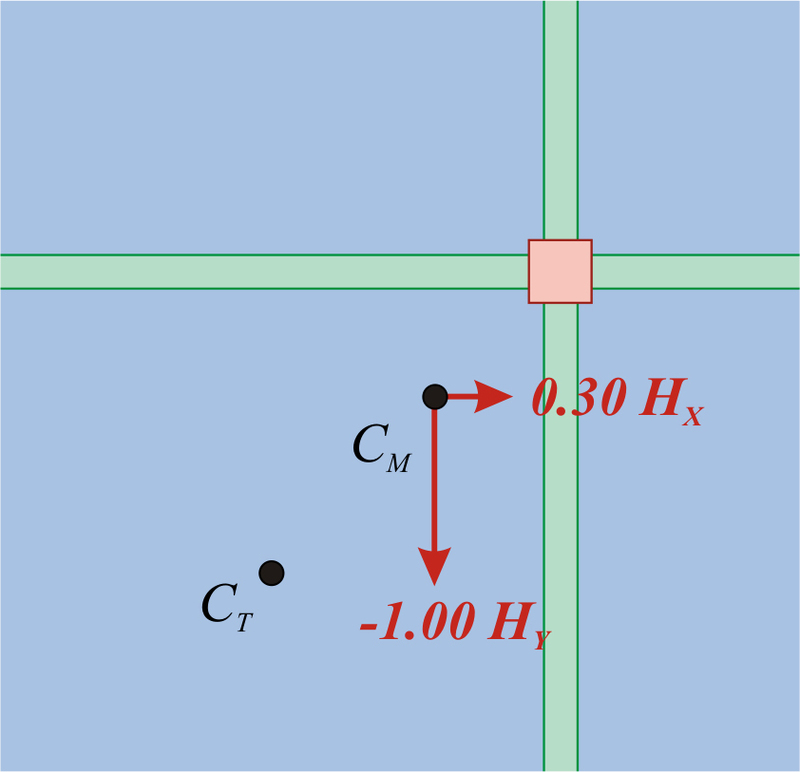 An efficient way to determine the most unfavourable bending of e.g. column cross-section of a storey, is to perform the dimensioning of the 33 cases under biaxial bending and select that corresponding to the maximum total area of reinforcement As,tot (of course for a specific arrangement of bars). This technique is used by the related software. Therefore for every type of structure, even if coincidence of the centres of mass and stiffness occurs due to double symmetry, biaxial bending will still be developed due to the accidental eccentricity which induces a significant seismic moment at each diaphragm. A significant torsional stiffness should therefore be provided to diaphragms (according to §5.4 torsional stiffness is Kθ=M/θZ) i.e. a significant resistance in moment M resulting in a relatively small diaphragm rotation θZ about Z axis. 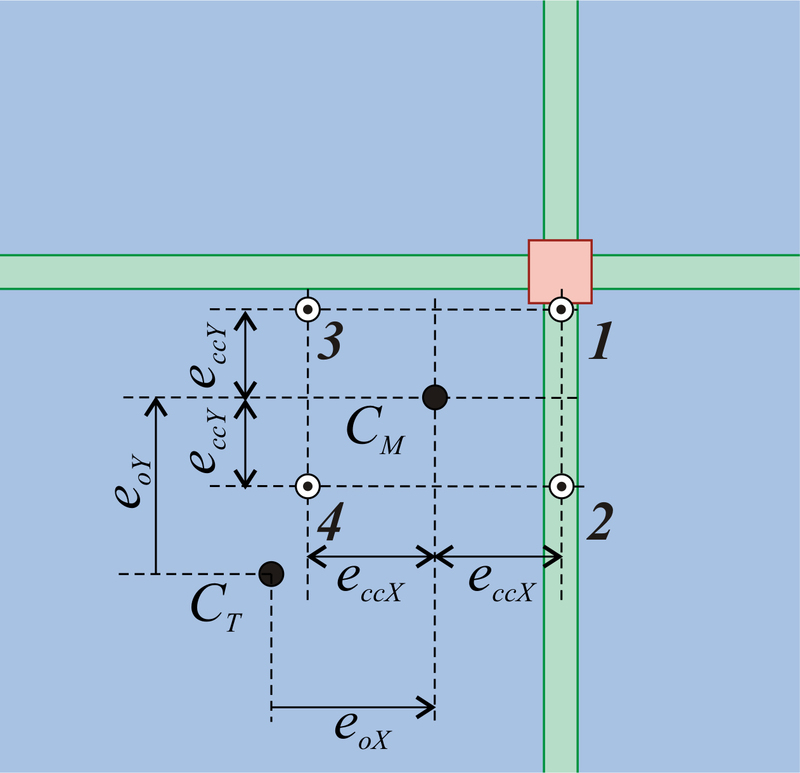 To limit large deformations due to rotation and to prevent columns from being subjected to high biaxial bending, the arrangement of adequately high stiffnesses along the diaphragm perimeter is required for minimizing the diaphragmatic rotation. For instance high stiffness is provided by a shear wall or a strong frame.